A Japanese love story that takes place during World War 2. It follows a young Japanese man who goes to war and tries to stay connected to his true love. A Japanese father travels to China's Yunnan province in the place of his ailing son to film a famous folk-opera star. The film tells story of a close friendship undone by love. 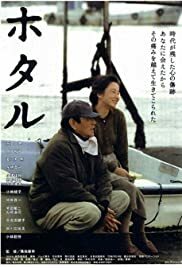 Shuji was once a feared member of the Yakuza crime syndicate, but he's reformed his ways, abandoned his old life and left the city for a small coastal fishing town where he's become an honest fisherman. Western film makers, and especially American film makers, have presented their paeans to the soldiers who fought in WWII -- but I've often wondered how this topic was dealt with in Japan. Rather than focus on heroics or bravery or battles or military might, "Hotaru" presents a simple and respectful portrait of those who survived and the lives they led. It is a simple story about ordinary people who lived through extraordinary times. Others have commented that parts of the film seem disconnected -- I agree, in that certain story lines appear and the stop, as if the editor simply forgot to remove them completely when the director changed his mind. And, indeed, some of the performances are bland -- but the work done by Takakura-san and Tanaka-san is outstanding. They present the soul of their generation -- and of their nation -- with nothing less than nobility. Furuhata-san, the director, has used his camera with the softness of a lover's caress upon the scenery. There is a sense, in his deft touch, of the organic one-ness of man and nature found in Shinto beliefs. Each cloud, each wave, each blossom serves to help us understand the lives of the characters just as much as the characters help us understand the "Japan-ness" of Japan. This is a lovely film -- you would be well-advised to see it with someone special.